A West End Community Plan pilot project is launching on Tuesday, July 30th. We are creating a new ‘heart of Davie Village’ plaza, partnering with the West End BIA with support from Qmunity and local businesses. The plaza will be on Bute Street between Davie Street and the lane south of Davie. The plaza will include colourful picnic tables, enhanced landscaping, and decorative lighting. It will provide a space for recreation and play, gathering and socializing, and programming and events. It is intended to be a ‘canvas’ for creative use by community groups and others. The plaza supports the emerging directions of the West End Community Plan encouraging vibrant commercial streets and celebrating Bute and Davie Streets as the ‘Heart of Davie Village’. It also supports the City’s Transportation 2040 Plan by creating a vibrant public space to support public gathering, walking and cycling. 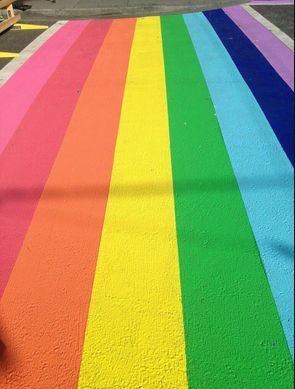 To further enhance the ‘Heart of Davie Village’ and celebrate the 35th anniversary of Pride, permanent rainbow crosswalks will be painted at the intersection of Bute and Davie Streets. We hope you get a chance to enjoy the transformations happening at Bute and Davie Streets! If you’re interested in helping with landscaping in the plaza, show up with gloves, boots and a smile and come down to Davie and Bute Streets between 9 am and 5 pm today (Thursday) or tomorrow (Friday). If you have any questions or want to learn more about this initiative, please contact Holly Sovdi at 604.871.6330 or holly.sovdi@vancouver.ca. Or come down to the site today or tomorrow. I want the rainbow colours be painted in my neighbourhood also. Robson And Denman Streets. our neighbourhood needs a pickup….love the colours.